Nomadic pastoralists, whose livelihoods depend on the health of their animals, are among the hardest hit by inadequate rainfall. A large double-decker truck is quickly making its way towards Garadag from Fadigaab, in the south of Somaliland. It is carrying nine families and what is left of their herds: some sheep, goats, and donkeys. It is even carrying their homes – herders can dismantle their huts quickly and rebuild them in different locations. This is what pastoralists have done for centuries, following the movements of their animals and the changing seasons. 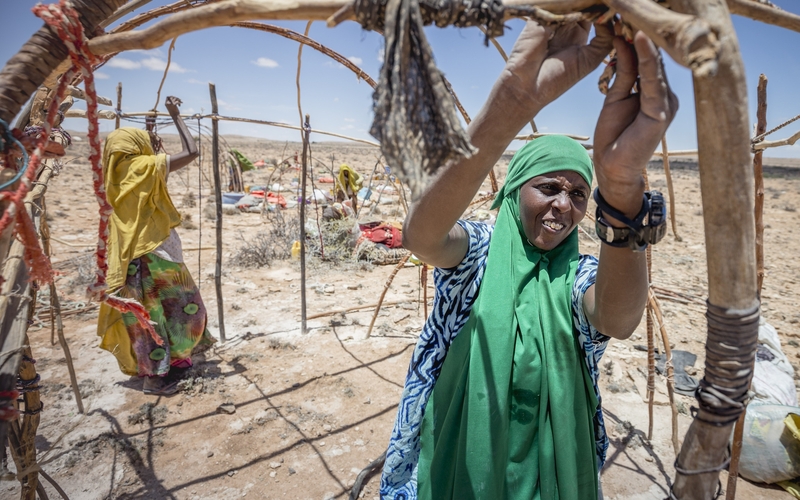 However, because of the drought's effects on the Horn of Africa, these nine families have had to move six times between October 2016 and March 2017. They continue to seek drinkable water for themselves and their animals, hoping they will be able to hold out for the rainy season. The region was hit by an 18-month drought caused by El Niño and higher temperatures linked to climate change. Now, in the midst of even more drought, the situation has become catastrophic, causing crops to fail and cattle to die. In addition, the lack of clean water increases the threat of cholera and other diseases. Across Ethiopia, Kenya, Somalia, and the autonomous region of Somaliland, millions of families are facing severe hunger. There are increasing concerns that the situation will get much worse. Droughts are not new to this region, but they are intensifying. There is growing scientific analysis suggesting that climate change aggravates their impacts. 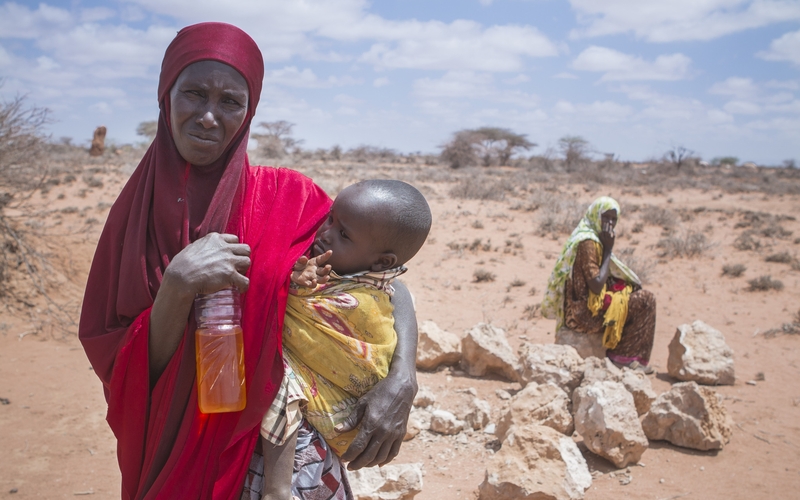 For many in East Africa, the current drought is the worst in living memory. We are now in the third year of very low rainfall coupled with high temperatures, which have exhausted people’s ability to cope with drier conditions and scarce and unpredictable rains. The drought has left exceptional numbers of people without most or all of their livestock. Nomadic pastoralists live on harsher lands and receive little support from governments. More frequent droughts are making it harder for people to recover between shocks, making them more vulnerable to the next crisis. 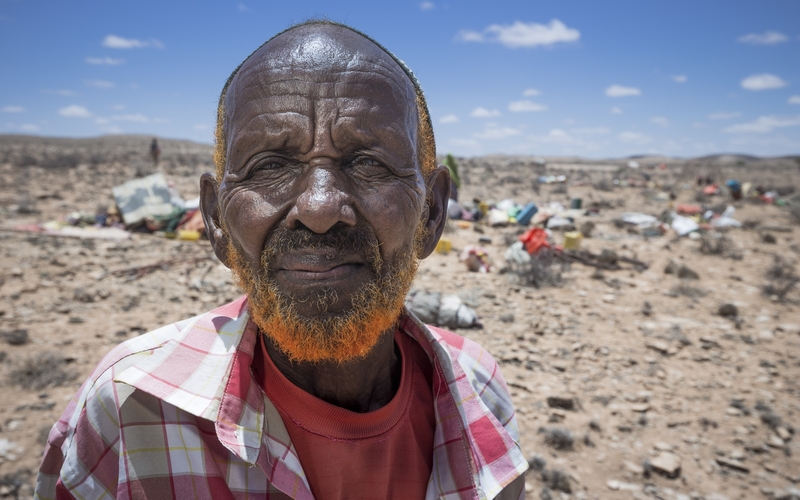 In eastern Somaliland, which has been ravaged by this catastrophe, Oxfam has witnessed entire communities on the move, desperately searching for water and pasture, and chasing the rains that have been forecast but are yet to materialize. Many say that this drought is worse than the one in 2011, which left a quarter of a million people dead and vast herds of livestock completely wiped out. This left survivors without the means to feed themselves or make a living. Nimo Mohamed, 40, has been suffering from diarrhea for a few weeks. Her husband and daughter-in-law are in the hospital, so she is looking after her grandchild on her own. This morning, she walked to the airport in search of food and water distribution, but found nothing there. In her small village, Mohamed had taken care of 170 animals. But, she says, they started "dropping like flies." Now, she has less than 30 sheep and goats. "If the rains don't come, we'll die very soon," she says. "We don't have any food. We all share what we have - it is the only way to survive." Mahmoud Geedi Ciroobay is from Kalsheikh, 37 miles away from where the pastoralists have settled near Garadag. Farhia Mohamad Geedi is 25 years old. She came here with her four-year-old daughter, Zeinab, her mother, and the rest of her family in hopes of finding new pastures for the few animals in their care. They used to own 100 goats and 100 sheep, but none survived. “Our animals started dying in October-November. The last animals we had died in February. So now we help our relatives looking after theirs. Together, we all decided to move here, as there are some pastures nearby and it could be better for our livestock,” she says. These pastoralists are among the millions of people on the brink of starvation. Meet a few of the individuals working hard to overcome hunger, and find out how you can help. Imagine shivering in freezing temperatures for long hours without a bathroom break. This is the reality for workers around the world who produce the food sold at supermarkets like Whole Foods. Support them now. When women thrive, communities thrive. On International Women's Day, we celebrate the amazing things that happen when women join forces.